A screenshot of RTA's operation. Leading integrated measurement, packaging and product inspection solutions provider Diverseco has announced the acquisition of Robot Technologies/Systems Australia (RTA). A screenshot of RTA’s operation. 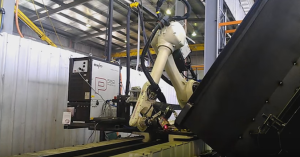 RTA is Australia’s leading integrator of robotic automation with over thirty years of experience and expertise in industrial robotics, manufacturing automation, process automation and factory automation. Established in 1986, the company supplies and services robotics equipment for businesses within a broad range of industries including manufacturing, mining, commodity handling, defence and pharmaceutical. Brenton Cunningham, Diverseco CEO said RTA will be closely aligned with another Diverseco company, Scaco Pty Ltd, due to similarities in their automation operations. “RTA is a valuable addition to our group, and will complement and enhance our group’s current capabilities, especially our supply of solutions to the manufacturing, packaging equipment and freight sector,” Mr Cunningham explained. RTA General Manager Trinton Smith said the purchase “heralds a new era for the company”, at a time when the manufacturing industry is undergoing a technological renaissance that is transforming operations. “With Diverseco’s financial backing, corporate support and vision, we are excited about future opportunities and realising RTA’s full potential – as the go-to company for any business seeking sophisticated robotic automation solutions,” Trinton said. Under the terms of the agreement, RTA founder Doug Smith will remain at the company and will be responsible for managing some key areas for the foreseeable future.